Del Webb, Huntley - Kane County - Announcing a price reduction on 12903 FARM HILL DR., a 2,804 sq. ft., 3 bath, 3 bdrm single story in Del Webb Sun City Huntley. Now $349,900 - REDUCED!!. This is a 55 plus community. Del Webb, Huntley - The single story at 11840 NOTTINGHAM DR. in Del Webb Sun City Huntley has been sold. Del Webb, Huntley - Kane County - We invite everyone to visit our open house at 13229 Cedar Crest Ln. In Del Webb Sun City Huntley on May 15 from 12:00 PM to 2:00 PM. This is in a 55 plus community. 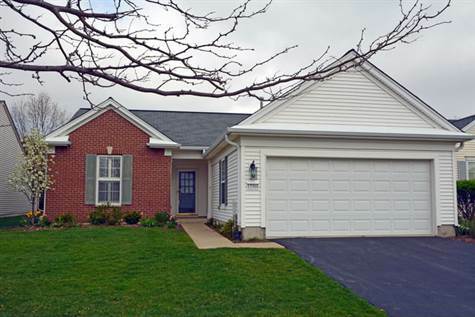 Del Webb, Huntley - Kane County - Announcing For Sale: 13229 Cedar Crest Ln. in Del Webb Sun City Huntley, a 1,564 sq. ft., 2 bath, 2 bdrm single story. Now $195,000 - Hardwood floors. Del Webb, Huntley - We invite everyone to visit our open house at 13560 Honeysuckle on May 1 from 12:00 PM to 2:00 PM. Del Webb, Huntley - Most popular of all models. New painted Fox model priced to sell in Del Webb. Light and bright. Features wood floors throughout except bedrooms. Corner fireplace in Great room, and electrical outlets in floor for lamps. Den with lots of built-ins, extended cabinets in dining, under counter lighting in kitchen, and 5 ceiling fans. Master bedroom boasts bay window, huge walk in closet, and double bowl vanity.2nd bath has whirlpool type bathtub. Laundry room with sink. All window treatments and appliances stay. 90% efficiency furnace. Large stamped concrete patio and back yard landscaping for privacy with a fountain. You will love the Lifestyle of this 55 plus active resort-like community. Please note--taxes are with No exemptions. Del Webb, Huntley - Announcing For Sale: 13560 Honeysuckle, a 1,678 sq. ft., 2 bath, 2 bdrm single story. 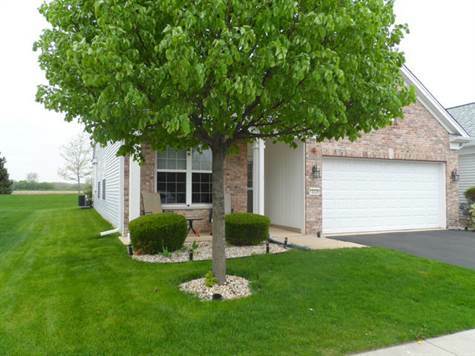 Now $224,900 - Del Webb Sun City Huntley. Del Webb, Huntley - We invite everyone to visit our open house at 12845 RIVER PARK DR. on April 24 from 11:30 AM to 1:30 PM. Del Webb, Huntley - Del Webb original Grand Haven with stone elevation. Immaculate. Approximately 1800 sq. ft. Sits on open space lot backing to creek and Wildflower Lake. Large covered front porch. Fireplace with Gas logs in family room. Fantastic kitchen with built in oven and table space for dining. Large pantry. Large master suite with soaker tub. Two full baths with raised vanities. Three ceiling fans. Large private brick paver patio with oversize pergola. Driveway and walk ribbons. Underground automatic sprinkler system. Manicured Lawn. Garage with extra storage space. EZ-GO Electric Golf Car included. Del Webb Sun City Huntley is an active adult community. One person must be 55 or older and no one under the age of 19 living here full time. Come enjoy the lifestyle. Del Webb, Huntley - Announcing For Sale 12845 RIVER PARK DR., a 1,794 sq. ft., 2 bath, 2 bdrm single story backing to lake and creek. EZ-GO Golf car (electric) included. Now $279,900 - GREAT VALUE. • 1,882 sq. ft., 2 bath, 2 bdrm single story - $249,900 - Value here! Del Webb, Huntley - Popular Del Webb original Petoskey model with 2 1/2 car attached garage for golf cart parking or storage. Premium lot w/ trees. No houses directly behind. Plantation shutters in most of home. Kitchen with island, breakfast bar, and separate breakfast table area. Light and bright living room and dining room. Master suite features lots of built-ins and a luxury bath. Fantastic extended brick paver patio with a pergola. Landscape irrigation system. Extensive landscaping. Garage cabinets to remain. Outstanding location. Enjoy all of the amenities Del Webb has to offer in this resort style 55 plus community. Voted the best place to retire in Illinois. Del Webb, Huntley - Popular Del Webb original Petoskey model with 2 1/2 car attached garage for golf cart parking or storage. Premium lot w/ trees. No houses directly behind. Plantation shutters in most of home. Kitchen with island, breakfast bar, and separate breakfast table area. Light and bright living room and dining room. Master suite features lots of built-ins and a luxury bath. Fantastic extended brick paver patio with a pergola. Landscape irrigation system. Extensive landscaping. Garage cabinets to remain. Outstanding location. Enjoy all of the amenities Del Webb has to offer in this resort style 55 plus community. Voted the best place to retire in Illinois. Exclude dining room light. Del Webb, Huntley - Announcing For Sale: 12958 W. Willow Creek Ln., a 1,882 sq. ft., 2 bath, 2 bdrm single story. $249,900 -Wonderful home here!. 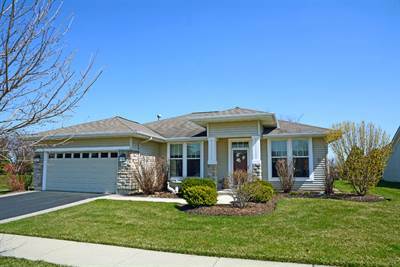 Del Webb, Huntley - Kane County - The single story at 13446 DAKOTA FIELDS has been sold.